I love, love, love Christmas! And this year I am finally able to get to the sewing machine & whip up some Christmas gifts, decorations & items for the home. As I mentioned last post, I recently subscribed to Sew Box Subscriptions & as part of my personal challenge to create more, have had heaps of fun creating different things with the contents of the Nov box (plus a bit of fabric from the Oct box thrown in). I pop on some Christmas music & happily spend time in my craft room. My all time favourite Christmas album to sing along to is Casting Crowns, Peace On Earth. Along with traditional carols, they have some of their own songs, celebrating the birth of the saviour of the world. Here is a summary of the past few weeks sewing creations. 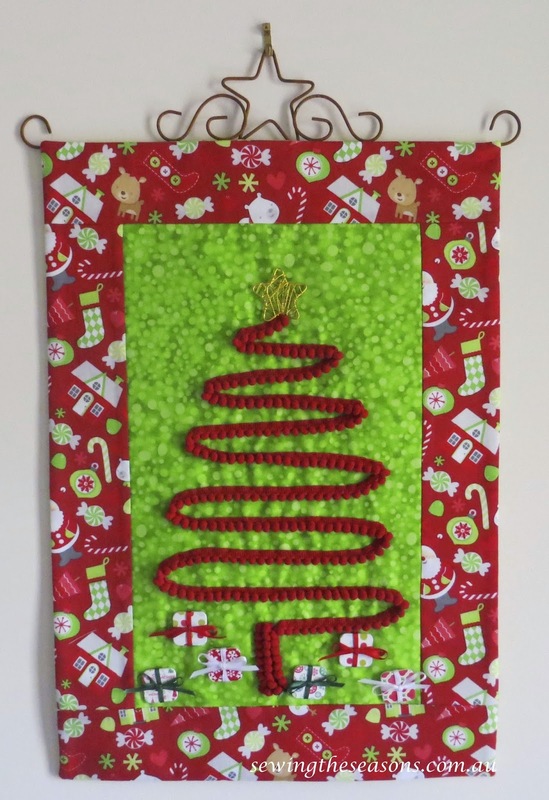 Decorations & gift wrapping ideas all sewn up. 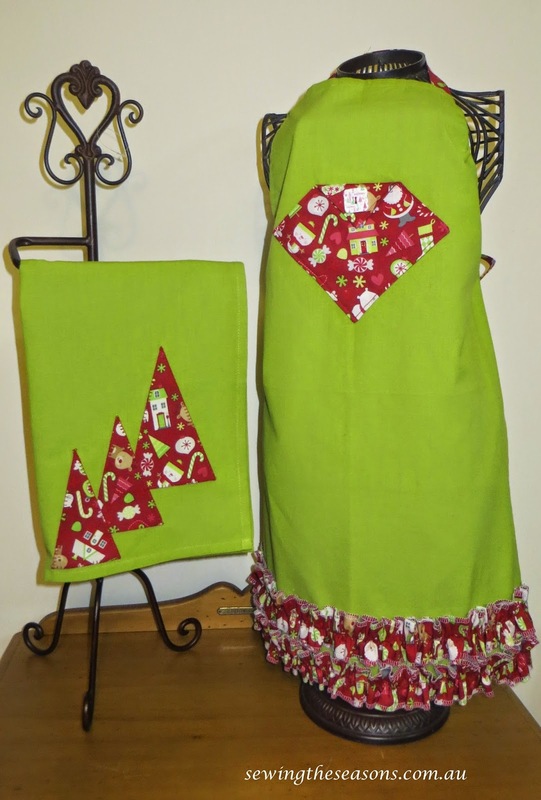 The tea towel was a great way to use up some of the scraps of Christmas fabric, simple applique using visoflix plus a button hole stitch on my machine. The green apron is based on a tutorial from the Missouri Quilt co, but I created my frill a little differently. Half apron, also using a tea-towel. Stay tuned, over the next few posts I will be sharing tutorials for the wine bags, decorations & aprons. 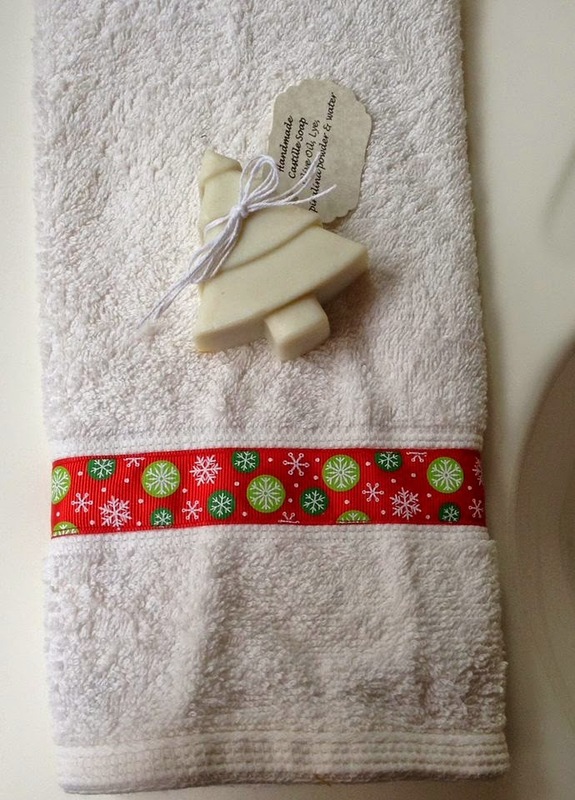 And finally, a very quick & simple project using some Christmas ribbon to decorate a hand towel, ideal as a gift or for your own bathroom.